We are Varsity Termite and Pest Control and we are proud to be helping our customers in the San Tan area. Scorpions can be a nuisance, and eradicating them is a job best left to the professionals at Varsity. When you think nothing can be done to stop scorpions from getting in your Arizona home, there is” Scorpion Barrier” by Varsity. 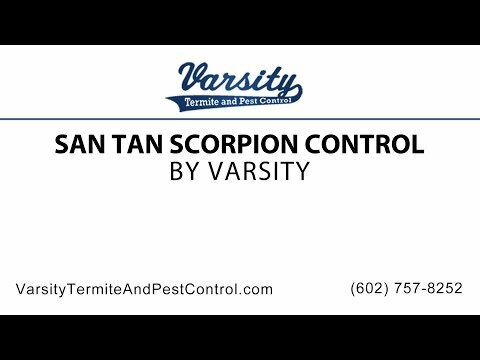 Varsity is a leader in San Tan scorpion control. We have been stopping scorpions with the Scorpion Barrier system for years with great success. So don’t let scorpions into your home, call us at 602-757-8252 or visit us online at varsity termite and pest control.com, today to get your estimate. Varsity’s Home Sealing Service Gives You Multiple Layers of Protection 24hrs a Day! The poisonous “bark” or “crevice” scorpions are pale and small, making them difficult to see. They are common throughout many habitats but almost always in rocky areas and are very able climbers. While most scorpion species are solitary in nature, the Bark Scorpion is an exception. They can congregate between 20 to 30, which make them even more menacing. The venom of the Bark Scorpion may produce severe pain (but rarely swelling) at the site of the sting, numbness, frothing at the mouth, difficulties in breathing (including respiratory paralysis), muscle twitching, and convulsions. Death is rare, especially in more recent times. Antivenin is available for severe cases. Certain people, however, may be allergic to the venom and can experience life-threatening side effects when stung (as occurs with bee stings).